Governments across Europe could be doing more to develop transport policies that ensure those over the age of 65 remain active and mobile, according to a new study led by the University of Plymouth. 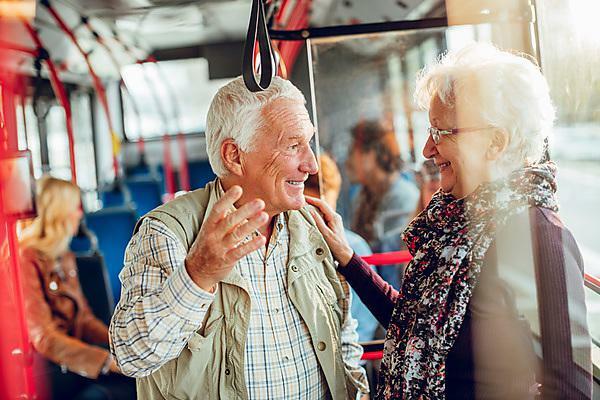 With the health and life expectancy of older people generally improving across the continent, it is likely they will make more journeys by car, public transport and foot over the coming years. However, active ageing spans many policy areas – including health, social care, economic development and urban design – and, as such, there is often a lack of joined-up thinking about the best approaches to older people’s mobility. To address this, the researchers sought to establish the extent to which national governments promote the specific age-friendly qualities of transport systems. By assessing documents across the European Union, Norway and Switzerland, and speaking to government employees in 20 countries, it determined to what extent individual nations encouraged mobility, independence and social and economic inclusion. The results, published in Transport Policy, showed disproportionate emphasis was being placed on safety, affordability and disabled (or barrier-free) access whereas a more rounded approach could actually lead to greater mobility among older people. The study was led by Research Fellow Rebecca Johnson and Jon Shaw, Professor of Transport Geography, from the University’s School of Geography, Earth and Environmental Sciences, and also involved academics from the Erfurt University of Applied Sciences in Germany. “It’s very clear from this work that there will be difficult challenges for policy makers as they seek to cater for older people’s transport requirements in the future. This may well be the last thing they want to hear in an environment of restricted public expenditure, but a key message here is that improving the quality of the transport system for older people generally means improving it for everyone. The international assessment identified 146 documents from 29 countries which could be classed as falling under EU-wide guidelines on ‘people with reduced mobility’, with 63 per cent solely concerned with older people. It then scored them against 11 qualities, seeking to establish if they were focused on being: affordable; available, barrier-free; comfortable; comprehensible; efficient; friendly; reliable; safe; secure and transparent. The extent to which these qualities are addressed varies across Europe, but safety, barrier freedom and affordability are prominent at both a national and EU level. However, the researchers suggest there are sporadic pockets of excellence in the other areas across Europe, and that by talking to each other governments could learn valuable lessons from each other. The full study – European national government approaches to older people’s transport system needs by Johnson, Shaw, Berding, Gather and Rebstock is published in Transport Policy, doi: http://dx.doi.org/10.1016/j.tranpol.2017.06.005. It was funded through the European Commission’s FP7 programme, as part of the University of Plymouth-led Transport Needs for an Ageing Society (TRACY) project. Professor Jon Shaw’s research work has a common thread of transport policy. Together with Dr Andrew Seedhouse from South West Smart Applications Ltd, they have been awarded more than £4 million of government funding for the nationwide introduction of smart ticketing (similar to the Oyster Card). Now almost all the buses in the South West England have been equipped with ticket machines compatible with smart ticketing, and an increasing number of smart ticketing options is starting to appear. This work was judged as a 4* Impact Case Study in the 2014 REF.